The 2-port slip-in cartridge valves (also: “Logics”) from HYDAC are the valves with the highest performance and largest-size. 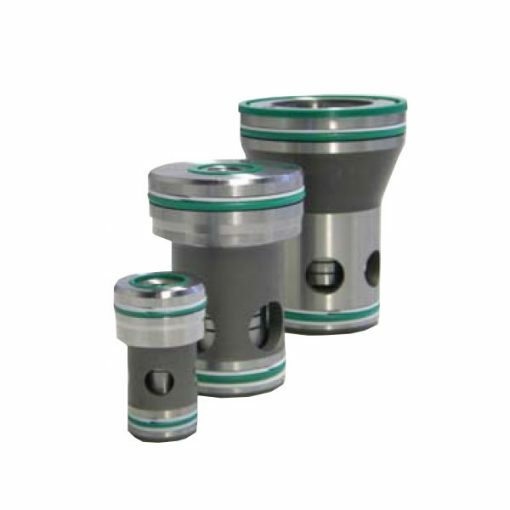 Their control is by the corresponding cover with built-in pilot valves, which make the high pressures and flow rates possible. What’s more, the operation of the main flow through the ports A and B is hydraulical. This happens because of a controlling pressure at port X. Also, the cartridge valve is normally closed leakage free A <-> B. It consists of a poppet with sleeve, cone and closing spring. The location of the closing spring is in the valve cone and affects the minimum operating pressure. Furthermore, it is holding the valve in the unloaded position closed. 2-port slip-in cartridge valves according to ISO 7368 with two operational ports A and B.